The 2007 vintage marks the first vintage where proprietor has eliminated Sangiovese from his top wine Giorgio Primo, and use only his best Merlot, Cabernet Sauvignon and Petit Verdot for it. All the Sangiovese now goes into the second wine La Massa and thus more La Massa and less Giorgio Primo. Giorgio Primo review to follow, but it is a wine to definitely look out for as it no doubt will get more expensive. You can still find it for about 50-75$ a bottle, but not for long. The 2007 La Massa reveals unusual harmony and grace. This expansive, generous La Massa offers plenty of perfumed red fruit, licorice, new leather and spices in a seamless, opulent style. The wine’s balance and sheer class are impeccable. 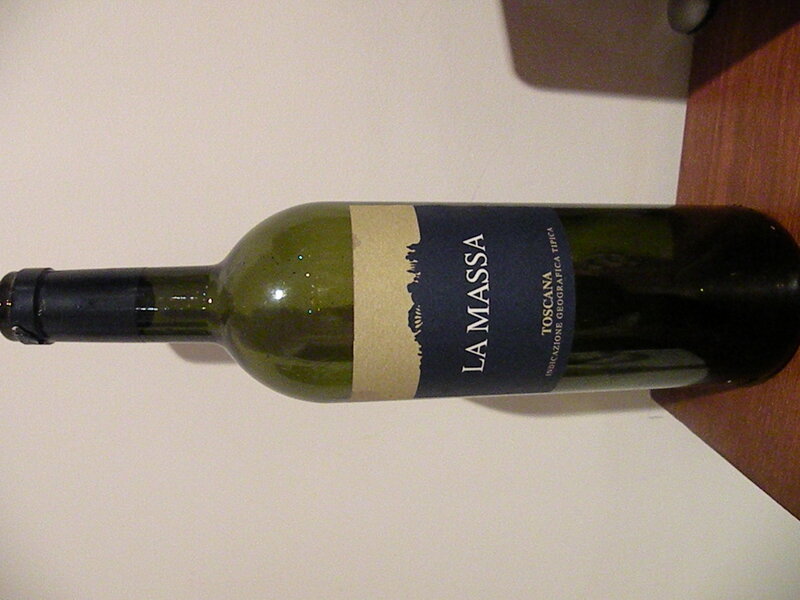 In 2007 La Massa is 70% Sangiovese, 20% Merlot and 10% Cabernet Sauvignon that spent 12 months in oak, 10% new. La Massa remains one of the top relative values in Tuscany. Anticipated maturity: 2009-2017. Happy New Year! I have tried some wonderful wines over this holiday season of which I will be sharing my thoughts and reviews with you over the next coming weeks. I bought a parcel of Spanish wines recently from a Christie’s auction, and have discovered some real gems most notably from Ribera del Duero and Priorat. 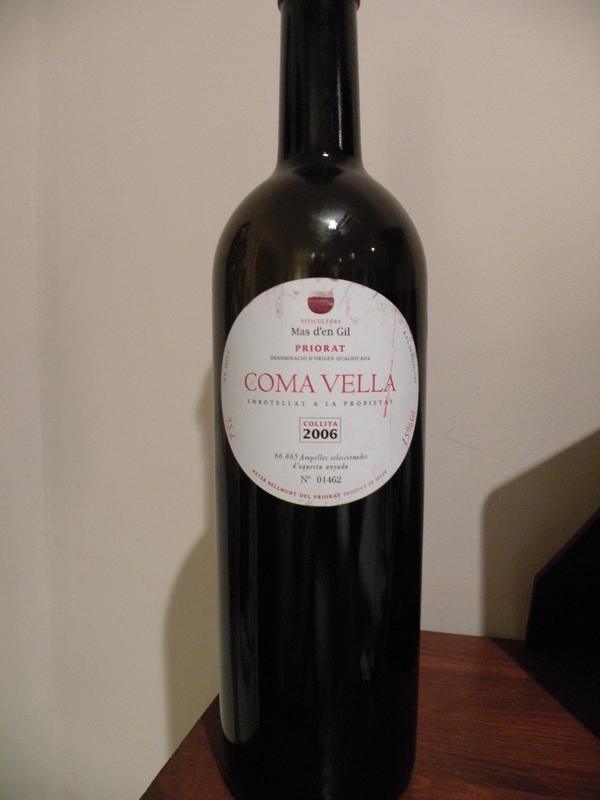 This Priorat, Coma Vella is a gorgeous blend of predominantly Grenache, Cabernet, Carignan and Syrah. While Grenache is the major focus here, the Cabernet smoothly bounces off the glass much like a Napa Cab Blend does, but softer. This is a superb, big and luscious red from Spain, and should be sought out. The Priorat wines don’t have much of a following, which is a shame. As Grenache is such a big component of most Priorats, I would say they are kind of like the Chateauneuf du Pape of Spain? I love Chateauneuf du Pape, and it looks like I will enjoy Priorat as well. my rating 92 pts. Coma Vella is available in the UK at Waitrose for about 23£ per bottle. In the US you can find it for about 40-50$ per bottle. (Alongside the magnificent Il Carbonaione is another one of my Supertuscan favorites, Terrabianca Campaccio, but review on that wine to follow in due course. I put that bottle in the photo for size comparison to the double magnum. The estate’s 1997 Carbonaione is sweet, ripe and full-bodied, but with plenty of supporting structure underneath. Complex notes of tobacco, leather, sweet herbs and spices have developed in bottle, rounding out this soft-textured, caressing Carbonaione. As is often the case with wines from warm vintages, provenance is especially critical. Impeccably stored bottles have as much as another decade of prime drinking ahead of them. Anticipated maturity: 2008-2017. 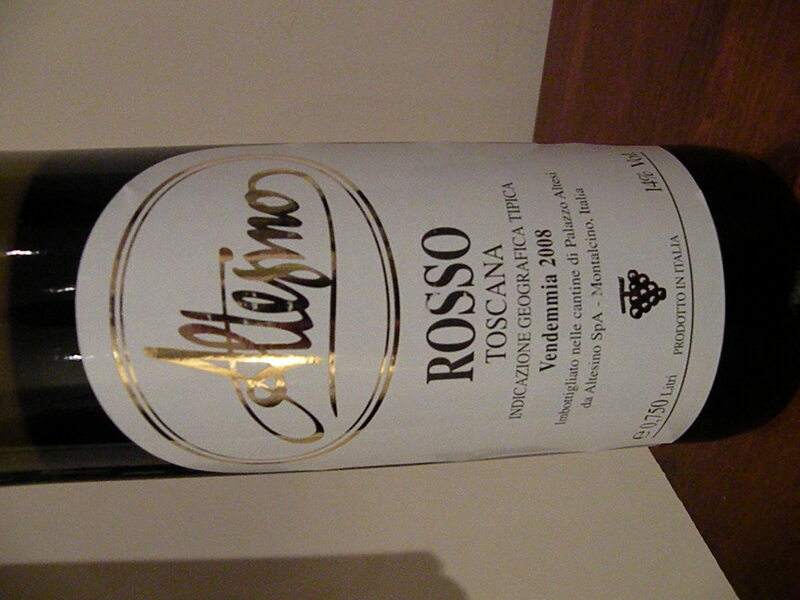 From this stellar Brunello producer, comes this lovely 2008 Rosso di Altesino wine which is perfect as an everyday red. It is made with about 75% Sangiovese, 20% Merlot, and 5% Cabernet. Luscious fruit on the palate with hints of cinnamon and cherry on the nose. This is an extremely affordable quaffer which will leave you wanting for more. Spaghetti Bolognese anyone? 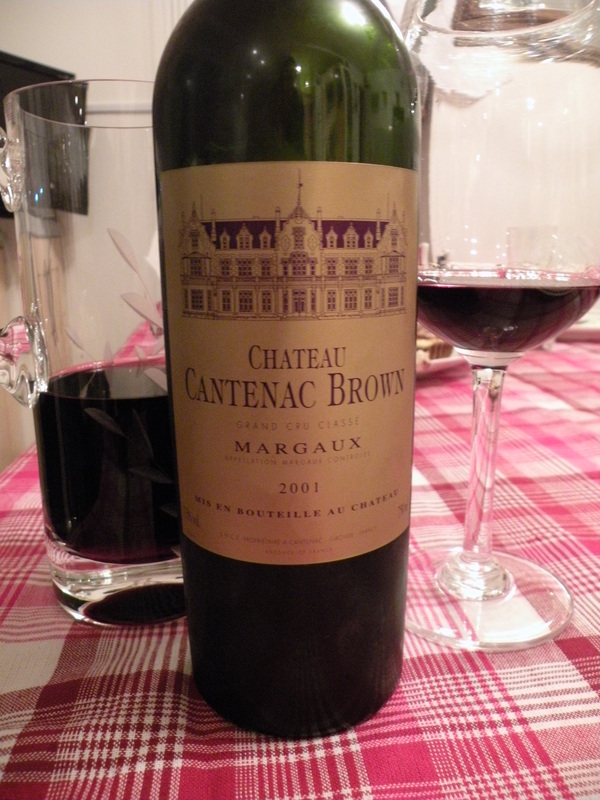 Widely available in the US for only $15-20 a bottle and in the UK at Bordeaux Index for under 10£ per bottle. Highly recommended. Buy this by the case load. My rating 89 pts. I have never really been a big fan of red burgundy, but have decided recently to give it another chance. I just want to make sure that I am not missing something special. In the past if I was going to buy a Pinot Noir, I would look to the big new world Pinots from Central Otago in New Zealand or the big muscular reds from Oregon and California. For the most part red burgundy that I’ve tried has reminded me of that awful cough syrup you were forced to take as a child, like Robitussin in the US. I don’t know why but that has been the impression I’ve always had. 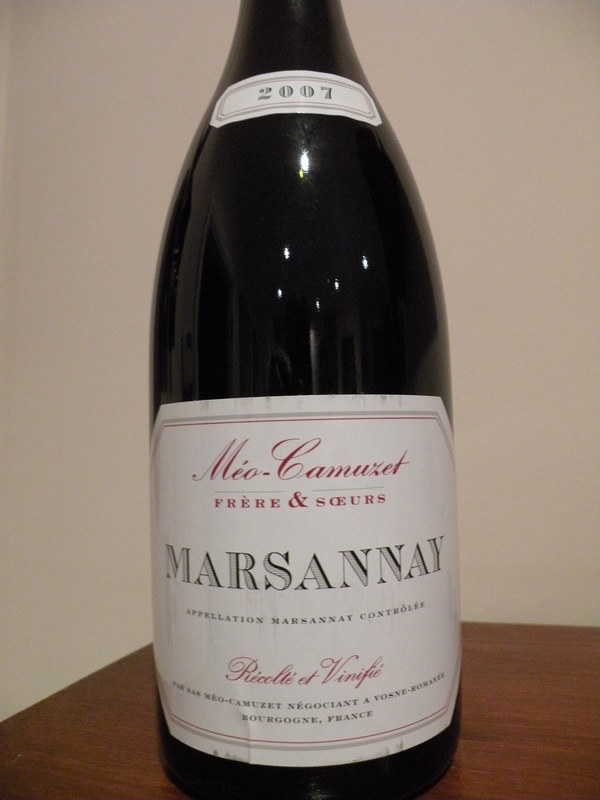 Now let’s turn to this simple red burgundy from Meo-Camuzet’s production in Marsannay. Let’s make no mistake, good red burgundy is not cheap. This one sells for 25£/40$ a bottle, and this is actually considered decent value in relative terms. I was actually pleasantly surprised with the strawberry aroma and smooth aftertaste. 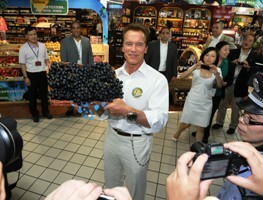 The wine is not too light, but could be bigger for my palate. Decent color, subtle rich tones and fruity. I am pleased with the taste, and am curious to try more red burgundy from different regions. I bought this particular wine from Uncorked in London. (Thanks Zoe. )Burgundy is a very complicated area, which is another reason why I have stayed away. I am still not convinced but wanting for more. Surely there must be a bigger style Pinot Noir from Red Burgundy which can stand up to the likes of Felton Road, Amisfield, and Mount Edward from New Zealand. I still prefer these for the moment…Stay tuned though as more to follow on this subject… My rating 87pts..
An earthy red berry fruit nose introduces round, rich, supple and relatively forward flavors that possess enough depth to be interesting on the acceptably long and delicious finish. Drink 2010+. I was fortunate enough to find a Magnum of this 10 year old South African beauty at Uncorked in the UK for only 40£. Magnums are always fun, and especially so since wine tends to age better in larger formats. This stunning South African bordeaux style blend almost tastes like it came from Napa Valley. Dark rich color and smooth tannins of sweet raisins. Chocolate fudge aromas on the nose. Very serious indeed. This particular vintage of Meerlust Rubicon is 70% Cabernet, 20% Merlot, and 10% Cabernet Franc. It is not overpowering either, at an avg 13.5% alchohol which works well. 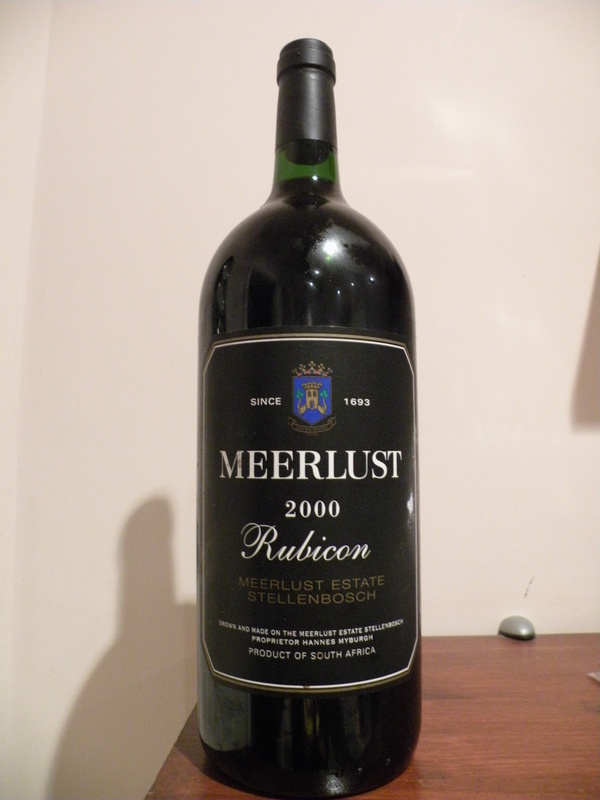 While you will probably struggle to find the 2000 vintage of this wine, Meerlust Rubicon is widely avaiilable for about 30$ a bottle in the US and 20£ per bottle in the UK. (available in the UK at www.uncorked.co.uk and www.slurp.co.uk) It is well worth buying if you see it. They also make an outstanding Chardonnay which is reminiscent of White Burgundy and worth seeking out. 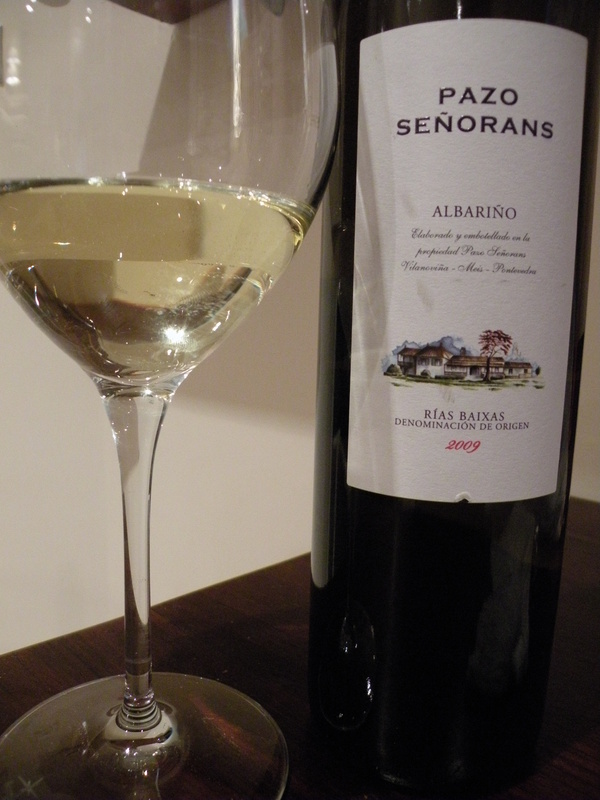 Review to follow, stay tuned……..
Pazo Senorans’ 2009 Albarino beautifully displays the high quality of the 2009 vintage in Rias Baixas. Light gold in color, it offers up a splendid bouquet of mineral, honeysuckle, lemon, and tropical aromas. Round, creamy, and remarkably concentrated, this outstanding effort will provide much pleasure over the next 4 years.Note: formerly known as Pazo de Senorans, the “de” has disappeared from the label starting in 2009. My Rating: 90 pts, ..recommended pairing: serve with Grilled Jerk Salmon and Fried Plantains.